It is widely known that nowadays most children are given less freedom than the children of previous generations. My own parents told me stories of how my grandparents allowed them to spend their leisure time climbing tall trees and cycling without a helmet for miles, not to be seen for hours upon end, with no worries as to where they were – as long as they were back in time for dinner. That was the 60s and 70s, but as a child of the 90s I grew up with a very different view of the world. One where the world was seen as more dangerous; a world where my friends and I followed strict rules on what we should and shouldn’t do and where we were and weren’t allowed to go. Increased exposure to negative news stories on the internet and social media has undoubtedly added to our fear of allowing children more freedom. Not to mention, the mass of health and safety restrictions we are surrounded by on a daily basis, which has contributed to our sue and claim society. It is no surprise that today children are more sheltered and protected, and maybe for good reason, but nevertheless, I cannot help but fear that future generations will lack the common-sense and independence to make practical decisions or have the confidence to experiment and be adventurous. It seems that we are depriving children of risky play, supposedly to protect them from danger, yet in the process we are setting them up to fail by depriving them of essential life skills. Childhood is about gaining independence, decision making and developing emotional resilience, hence taking more risks (Gray, 2014). Children crave space and the freedom to move, run and explore, particularly between the ages of 1 and 7, and it is proven that the more time children are given to free play, the higher their focus when carrying out more academic oriented activities, thus driving their desire to learn (Payley, 1984). Little (2006) defines risk as “any behaviour in which there is uncertainty about the outcomes”. Understanding risks and learning how to manage them is a key aspect of growing up, and if children’ are not given this freedom, they will never learn how to recognise and judge risks for themselves. Many Early Years practitioners are tackling this problem by introducing Risky Play to their settings. Risky Play allows children to do exciting and thrilling activities under supervision in a controlled environment, enabling them to test their boundaries and take risks (Early Years Outdoor Education, 2017). This is shown to have many positive implications in terms of children’s social and emotional needs and their fine and gross motor skills (Gill, 2007). Furthermore, knowingly taking a risk is not the same as being at risk unintentionally; Risky Play is carried out within a safe and controlled environment under adult supervision, thus knowingly taking a risk (Gray, 2014). Research has shown that the benefits of Risky Play among young children are endless, from enabling children to challenge themselves, be creative and self-assess, to improving their communication, engagement and problem-solving skills (Susa and Benedict in Ball, 2002). By giving children the opportunity to manage their own risks within a safe environment, they will learn essential life skills needed to face the tough and unpredictable nature of adulthood (Gill, 2007). Play England (2007) notes that it can act as a “powerful form of prevention in other situations where children and young people are at risk”. Given the vast quantity of health and safety restrictions in place and the unpredictability of children’s actions, the challenge in Risky Play is establishing activities that can be introduced and controlled within educational settings. Even with active encouragement from the Health and Safety Executive and OFSTED it is still daunting as an educational establishment to ensure that risks are available yet understandable. When searching for Risky Play activities for our own settings, we soon realised there was a gap in the market for ‘safe’ tools for both boys and girls, particularly within the Early Years sector. 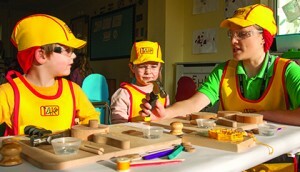 The directors of our own nurseries have a background in engineering and set about filling this gap by developing a specialised woodwork set, trading as T4Kids™. T4Kids™ helps Early Years settings introduce real tools to children as young as three, something which would be difficult to do without specialist equipment and sourcing age and size appropriate tools. T4Kids™ “How To” user guides also help educate staff to balance the risks that this activity presents with clear benefits and adventurous outcomes for the children. 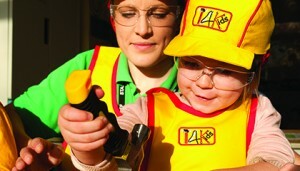 The T4Kids™ tinkering kits were developed with both the Early Years expertise of our nursery managers and the health and safety expertise of our Directors. The products have been ‘Tried and Tested’ by children and adults. Extensive research was also carried out on the psychology of young children. According to BF Skinner, the basic psychology of young children means that they generally accept rules as a given, therefore, when they are told that they must only do woodwork when they are wearing safety uniform, they will in turn follow this rule, therefore keeping them from attempting to do woodwork at home in an uncontrolled environment. This was a crucial aspect of the safety of the T4Kids™ sets and has enabled parents to be confident that their children will not attempt the activities at home unsupervised. We have been using our T4Kids™ tinkering sets within our own nursery settings for two years now and they have been a great success. We have found that by giving our children the freedom to explore and use their own initiative, they have learned to independently identify risks within a controlled environment and have even started to apply these skills to their own experiences in other situations, both inside and outside the nursery setting. Hands-on Risky Play within all educational settings, from nurseries and pre-schools to primary schools is vital to challenge and engage children, support their growth and give them the opportunity to make informed and independent decisions. Not only this but if we give children the chance to be truly free and creative, the possibilities for their future careers and the positive impact they may have on society is endless. If you would like to find out more about T4Kids™ Hammering and Drilling Woodworking Sets, please take a look at the T4Kids™ website.